A group of poor explorers. Unlimited riches. Untold Danger. 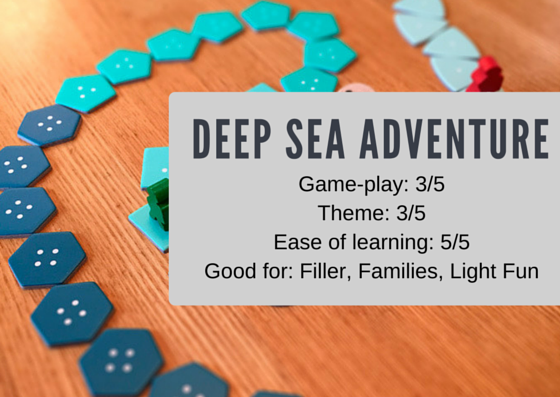 Oink Game’s “Deep Sea Adventure” and “Troll” both play with these themes. They are quick to learn and play. They have minimal components and look gorgeous on a shelf…but, despite the packaging, are they any good? In Deep Sea Adventure, everyone begins in the submarine. A particularly nice piece of this design is the inclusion of the game timer (the air supply) on the submarine. The players share a full tank of air at 25 units and count down as the divers exert themselves salvaging the treasure lurking below. Trailing below the submarine is a series of tokens representing treasure of increasing worth as you move further from the sub. One a turn, each player rolls two dice (with pips varying from 1-3 on each dice equaling a total range of movement equaling 2-6 spaces (depending upon encumbrance). If you land on a ruin token, you can chose to pick it up and place it face-down in front of you. If the space’s chip was already picked up, you can choose to put down a chip on that spot. Then you decide whether you are heading back to the submarine or going deeper down. This is the crux of your decision space in this simple game. Go deeper and pick up a ruin chip that is worth more or head back up and bank what you have in the safety of the submarine. The ruins tokens are worth more the farther you move away from the submarine but the deeper you go, the less likely you will make it back. This seems simple: Dive. Grab Points. Get back to the sub. However, the trick is finding the right time to turn back towards the sub. As people pick up more chips, they use up more air and time can start to move really quick. Now you are loaded with treasure and everyone else is as well. So the air runs out and you are still floating in the deep. Well, the automatic hitch activates and pulls you back up but you need to drop all the treasure in your possession. You score no points and those tokens are stacked in units of three and put at the bottom of the line. These stacks of three treasure tokens count as one token when it comes to movement. So a sack of three will only slow you down one pip on your roll rather than three. Anyone who made it to the sub with their treasure gets to flip them over and score. If you failed to make it back to the sub, your colleagues will rescue you minus your treasure, throw you in a decompression chamber to get you into shape for the next dive. If you succeeded in returning to the sub you get to keep your ruin chips and flip them over as treasure. They will not count against your air in the next round. The main mechanism of Deep Sea Adventure is roll and move. And it works just fine. Yes, you can be stymied by a series of poor rolls but the game is quick enough that you really aren’t dedicating that much time and most games will play shorter than the 30 minutes on the box. The press your luck mechanism of the game is drop dead simple — more you carry, the more oxygen you use up, and the quicker you run out of air to breathe. Thus, you are constantly looking to see how much other people are carrying and calculating how much you can afford to move in order to win. Oink Games has an amazing line of cute, accessible filler games in the most adorable tiny little boxes I have ever seen (TROLL, In A Grove, Rights, etc). The art work and the components are always minimalistic. Not much on the artwork, the graphic design is crisp and clear. The gameplay simple enough to teach to anyone new to games. The game and the box it came in are beyond endearing. They are cute and engaging enough for its size. Will it satisfy every gamer’s appetite? No. But it provides more than enough tension to make it worthwhile as a filler. It really shines as a family or kid’s game though. And you can’t beat the simplicity of roll, move, and pick up treasure. Do I want to add a giant squid circling the ruins? You bet I do. Will I? Probably. 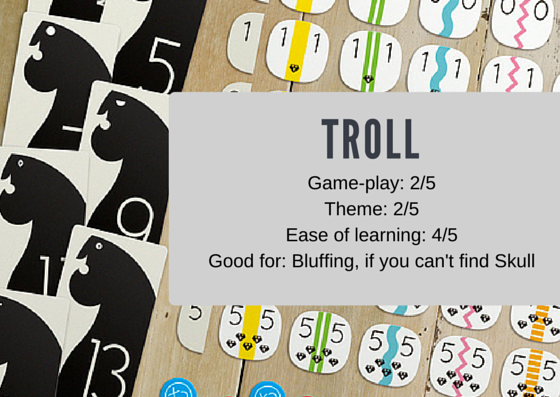 In TROLL, you one of 3-5 crafty thieves in a lair of hungry trolls. These trolls have precious jewels and you only have a few days and your wits to escape with as many jewels as possible. Each thief has a set of six tokens numbered 0-5 representing the number of jewels stolen from the Troll. Each troll in the troll deck has a number (3, 5, 7, 9, 11, 13, and 15). During the round, each thief will play one of their tokens. The first player (the scout) can look at the troll card to see the value and then plays a token. Then each thief, in order can either play it safe and look at the card and play a token face-up or be daring and place a token face down. When taking a daring action, the thief gets to place a x2 multiplier on the token to represent getting twice the amount of jewels if successful at their gamble. Once everyone has placed their tokens, the troll card is flipped over and the player’s tokens are arranged from smallest to largest. The tokens are then added up according to the amount of jewels they planned to steal. If your tokens totals less than the revealed troll’s number, you gain the points on your token (with additional multiplier if appropriate). Then the person whose token totaled or exceeded the troll’s number gets captured and gets a -2 penalty. Any one after the woken troll escape getting mauled but they don’t score any points. After two or three rounds (dependant upon the number of players), the game ends and the player with the most points wins. Troll gets the same high points for design, minimalist presentation and the cute box. However, the bluffing in this game is not particularly compelling. It feels more like quick arithmetic and guesswork than actual bluffing. And when you have something like Skull that does it better and even simpler, there isn’t much reason to bring this one out too often.